T-50 at the 'MAKS' 2011 airshow near Moscow. Despite numerous delays, the joint Indo-Russian Fifth Generation Fighter Aircraft (FGFA) project will not get cancelled. 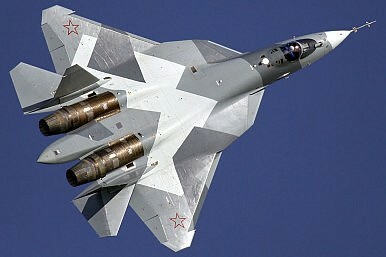 This week, the head of Russia’s United Aircraft Corporation (UAC) announced that a full R&D collaboration contract would be signed in 2015 with New Delhi for joint work on the derivative Indian version of the PAK FA T-50 fifth-generation fighter jet, the Perspective Multi-role Fighter (PMF). The contract could be signed as early as July, as a follow-up to Indian Prime Minister’s Narendra Modi’s visit to Russia. Defense News reports that according to an unnamed source within the Indian Ministry of Defense (MOD), India is compromising on various points of conflict over the joint R&D program. Most interestingly, the draft agreement will include a fixed order of 154 PMFs, and include a compromise on work share, a firm commitment to the number of single- versus double-seat PMF (aka Fifth Generation Fighter Aircraft) jets, and steps that specifically address each of the approximate 40 changes that the Indian Air Force (IAF) wants in comparison to the current T-50 prototype. Enduring Indian reservations over the FGFA program include those over the fighter’s AL-41F1 engine and its stealth and weapon-carrying capability. India is also insistent on Russia restoring its workload in the USD10.5 billion developmental program after recently reducing it from 25 percent to 13 percent without consulting Delhi. As I reported a while back (see: “What’s the Status of the Indian-Russian Fifth Generation Fighter Jet?”), New Delhi and Moscow agreed in early 2007 to jointly develop a fifth generation fighter program. Ever since then, the Sukhol/HAL Fifth Generation Fighter Aircraft (FGFA), or, as it is called in India, the Perspective Multi-role Fighter (PMF) project, a derivative project from the PAK FA T-50, has been plagued by delays, cost overruns, and unsteady technology. At this juncture, given the unfolding international geopolitics and Russia’s fast-depleting defense export order books, it is highly unlikely that Russia would take a take-it-or-leave-it stand. FGFA is a landmark, collaborative, futuristic defense project that would doubtless benefit both countries. Russia required FGFA for its industry to stay competitive with the Western systems, reduce development cost and guarantee an export customer; India saw it as a means to address the IAF–People’s Liberation Army Air Force imbalance and impart a measure of resonance to its combat aircraft development programs. Considering the anticipated delay in the project and to avoid any shortfalls in the IAF force levels, the options include: develop the indigenous AMCA; LCA MK II development would be indicative of capability; consider increased procurement of Rafale or F-35; propose to purchase 18 T-50s off the shelf and subsequently assess the probability of success of the FGFA. Moscow's answer to the American F-22 and F-35 aircraft will soon be inducted into the Russian Air Force.